Planning a trip or vacation and looking for Ontario’s best Attractions? Use our Attraction Listings Search – you can search by category, by name and by location. With more than 30 rides and attractions (plus 14 mouth-watering food outlets!) Centre Island’s iconic Centreville Theme Park is the ultimate summer destination for families with young children! Surrounded by 600 acres of gorgeous parkland and just across the harbour from the city of Toronto, you and your family can spin yourself silly in the Twirling Tea Cups, take a plunge in the Log Flume or bounce around in Bumper Boats and Bumper Cars – plus don’t forget to ride our Antique Carousel before heading on over to Far Enough Farm where you can interact with mini-potbelly pigs, horses, mini ponies, sheep and many more! Half the fun is getting here, take the short scenic ferry ride to Centre Island - your family will love the quick and scenic ride on the Centre Island ferry with unbelievable views of the Toronto skyline and planes flying overhead into the airport! The Jack Layton Ferry Terminal is located at 9 Queen’s Quay West, Toronto, Ontario, M5J 2H3. You’ll find the ferries at the foot of Bay Street at Queen's Quay West, just west of the Westin Harbour Castle hotel. Enter the Ferry Terminal via the walkway between the Westin Harbour Castle hotel and the Harbour Castle condominiums. Use the Centreville Amusement Park rideometer to plan your trip! For highspeed, thrill-seeking park goers, try the rides marked in red! If you're looking for a more relaxing trip, stick to green or get the best of both and jump on a yellow ride! One of our most popular residents at Centreville is our beloved mascot, Beasley Bear. Beasley Bear enjoys meeting guests around Centreville and is happy to stop for a photo (bring your camera to capture a special moment); he is also available for birthday parties and special event appearances. Beasley Bear was born in Centreville in 1967, his favourite rides include the Beasley Bear ride (of course! ), the Touring Cars, our Antique Carousel; and some days you will even find him driving the Centreville Train! Please note: There is no general admission fee to Centreville; to enjoy rides and attractions please purchase an All Day Ride Pass or ride tickets. 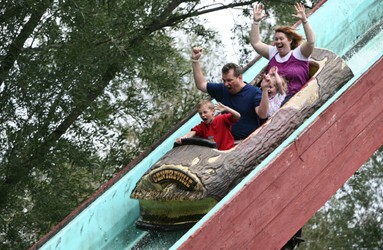 Centreville offers kid-sized thrills, laughter, great food and unlimited family fun – It’s Always Sunny At Centreville!